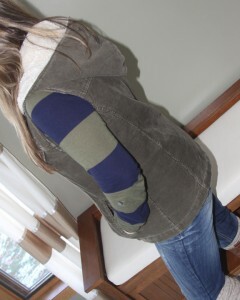 I took an old corduroy coat that I wasn’t wearing anymore an re purposed it into a fun fall vest that I love. Here is the exciting part….I used one of the sleeves to make a little doggie jacket! 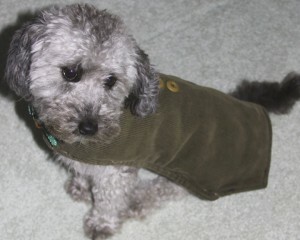 One old corduroy coat equals a fashionable fall vest t for you, and a cute little doggie coat for your best furry friend! I have had this jacket since I was in high school. Sigh … that feels like ages ago! I loved the army green corduroy and wool lining, but the coat was boxy and not very stylish by today’s standards. I was about to send it off to Goodwill when I had a bright idea! I love wearing vests all winter long. I wear them everywhere – with two kids to chase after, I am almost always sweating if I am wearing a full on winter coat – so vests are a great option for me. Easy layering with some style. Why not take off the huge bulky sleeves and see how my jacket looked as a vest? I took my seam rippers, and a small pair of sewing scissors and tore the sleeves of at the seam. There were about three layers to go through, but they came off cleanly enough that I could make the vest work. I then rolled the raw edge over and ironed a crease all the way around the arm hole. 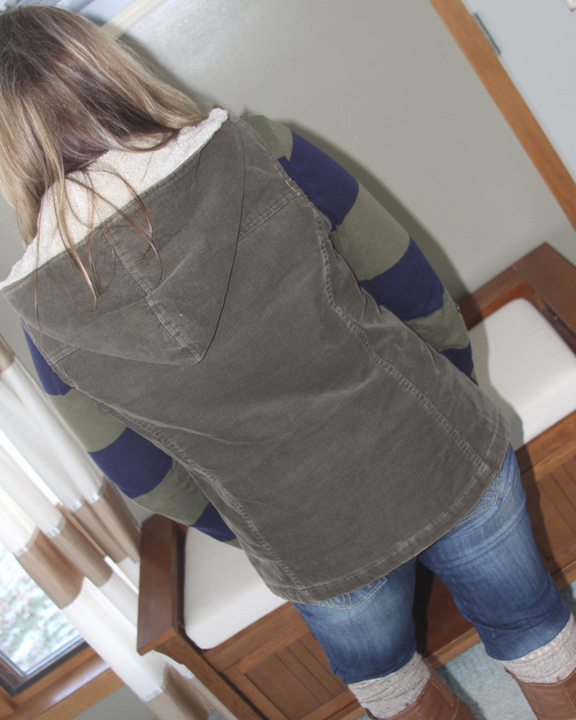 I pinned it all down and sewed a nice easy little hem around to create a vest. It was actually a pretty easy repurpose, and no one would ever know it wasn’t meant to be a vest. 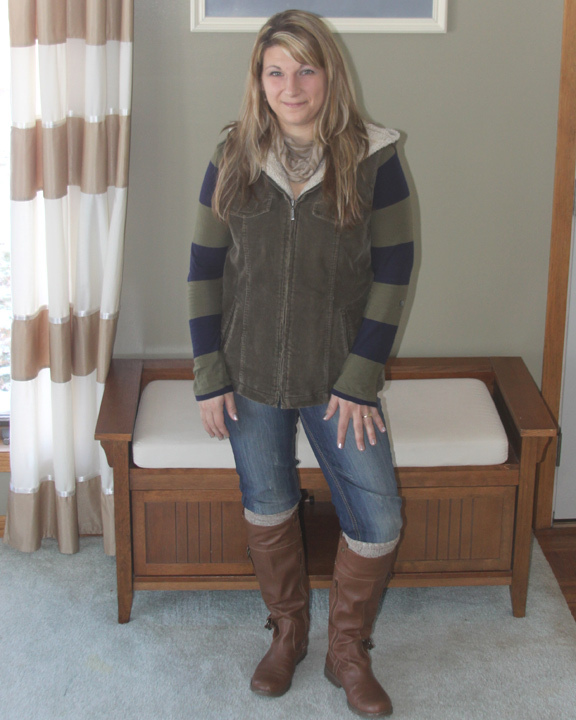 It is still a little boxy in the midsection, but it makes a great winter layering piece, and is cozy and comfortable. My favorite way to wear it is with skinny jeans, boot socks, and of course my riding boots. The vest has a great rugged look to it, and I can’t believe one of my high school jackets has a new life. 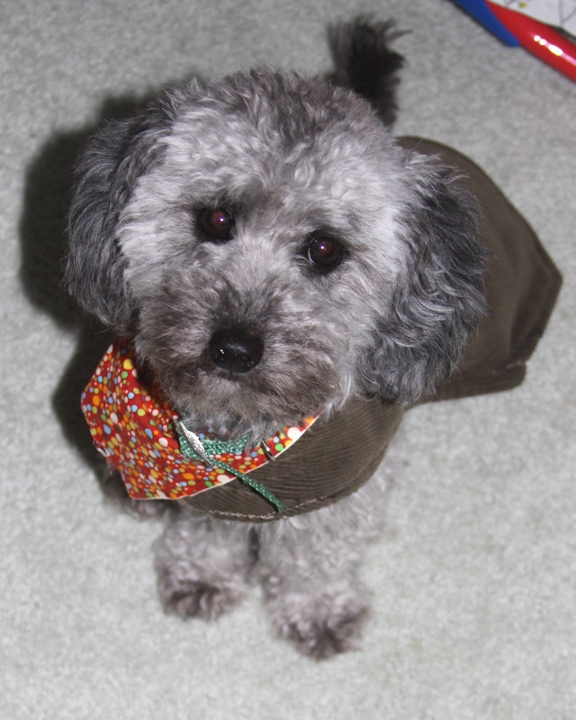 I had the sleeves laying on the table when our little Teddy bear puppy Jerry went trotting by. We were fostering this sweet little guy who didn’t have a home. He was probably only 6 pounds sopping wet, just a little guy. I felt bad for him when he went outside. That poor little guy was so low to the ground, he had to be freezing and Wisconsin winter’s produce enough snow to engulf the poor thing, easily. 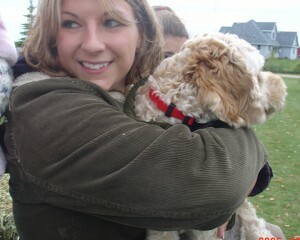 I thought the sleeves of my coat would make a great little dog blanket, just the right size for Jerry! Now, don’t think you are going to make a dog blanket for your 100lb yellow lab with a medium sized woman’s jacket sleeve! This dog is tiny, and if the sleeve fits…wear it, right? I opened the long hem that ran down the sleeve to begin. I cut out a horseshoe shape to make the part that would attach around his head, and added Velcro for easy on and off. I measured is length and cut the little blanket to fit, and squared the edges so he could move freely in it. I also added a strip of fabric to each side on the bottom of the coat and added Velcro to those as well. This held the coat on underneath his belly. The last little touch was three small dark yellow buttons, just for that awww factor. Jerry looked adorable in his new little coat. I can only wish that people oohed and ahhed over how cute I was, but it was mostly about the dog! The best part is that I was able to make a vest, and a dog coat for $0 dollars, and that feels pretty good. Two very useful things, from something that I was going to give away. Cool! You were wearing that vest when we went shopping and I thought it was really cute! I had no idea it was made from your old coat. Great job. CUTE! I have been thinking about attempting to make my Floyd a coat but wasn’t sure if my sewing abilities were up to it.